Very rarely, someone does something for you that is so significant, so awesome; so unexpected that you can’t just send them a thank you card and flowers. You need a way bigger THANK YOU. A little bit of a back story… If you’ve been following along, you might remember that my grandmother, THIS grandmother, spent months making every stitch of clothing and hunting down accessories to accompany the greatest Christmas present I ever received when I was ten; Molly, my American Girl doll. She didn’t just get me a doll and an entire wardrobe; she got/made THREE of them – one for each of her granddaughters. Oh, god… Is EVERYTHING about American Girl dolls these days? Even I need a break. Grandma Mary was sort-of synonymous with dolls for me as a child; she had an entire room filled with them (the “Pink Room,”), spent lots of time restoring ones from her own childhood and introduced us chickadees to American Girl dolls. I vividly remember sitting in the backseat of her car pouring over the first AG catalogue on a road trip to Iowa with her. I must have been five. Grandma is also Danish – which is definitely not Swedish like Kirsten, one of the original AG dolls, but it was close enough that my grandmother was partial to her… Kirsten had an adorable little Saint Lucia outfit for Christmas; and Grandma had made her own Saint Lucia doll, modeled after Kirsten’s dress. 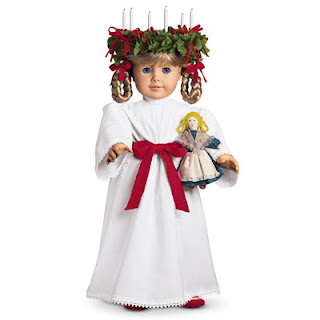 As a kid, I would fantasize about dressing up in a white nightgown and walking around with a wreath and blazing candles on my head. My parents never would have lit anything I placed on my head on fire (intentionally)… I always identified with Molly, the creative, slightly nerdy girl with glasses, but Grandma Mary? She was totally a Kirsten. After a legendary act of generosity this month, I was completely befuddled on how to thank my grandmother. I was also on my way back from a birthday excursion to the American Girl Store when it hit me. Grandma Mary needs an American Girl doll, too!! She needs to have Kirsten! This was a ridiculous idea because my grandmother is a grown woman; what is she going to do with a giant doll? (Let’s ignore the fact that I had just lost my marbles when Nathan told me we were on our way to get a doll for my birthday.) Also, they don’t make Kirsten anymore. She was retired years ago, and you can’t just get someone ANY American Girl doll. You have to get them their American Girl doll. But they do make all of the dolls in miniature, six-inch versions. So we got Mini Kirsten. Which is cute, but still kind of “thanks-for-buying-me-something”ish. Mini Kirsten needed a mini Saint Lucia outfit. And while I was at it, her mini accessories and a mini trunk to put her in. Just like the big Kirsten had. And so I set about trolling Hobby Lobby, Michaels and Joann Fabrics for supplies. Which was a blast. Then I set about cursing my will to live as I struggled with the teeny, tiny bonnet. But after that was done, the rest was cake. Just shoot me if Alice ever gets into Barbies. I even got to break out the old polymer clay. I have had it packed away for almost a decade, and I am way out of practice. I found some interesting little project that had never been baked when I cracked it open – clearly the mighty have fallen. Apparently I had gotten pretty good – although I’m not sure what kind of mood I must have been in to create that weird little head a decade ago. The trunk was my favorite part. I found the perfect sized wooden box, glued on some tiny feet, took off the hardware, filled the holes, sanded and painted the whole shebang about three times and painted little flowers on it. I am not a painter, my mom is. It is a far cry from the tole painted chest that Kirsten came with. This is not my strong suit. Obviously. I packed her up and sent her off to Grandma Mary. There was a little bit of a warm fuzzy in my heart when I realized my grandmother had done this same thing for me two decades ago (albeit on a much larger and more impressive scale). Full circle. I realize that this post might seem a little bit of “Oh! Look at me and see how awesome I am for spending all this time one something for someone else! Aren’t I thoughtful?” Yes, it was a lot of work. But I wanted y’all to understand just how rad Grandma Mary is; and when you have someone in your life who is that special, you are well within your rights to go a little bit overboard. Even if it is on an itty-bitty something that will probably live in a drawer and is of zero productive use to anyone. Cheers to you, Grandma Mary! (And thanks for playing the Grandma part well and telling me that you “love it.”) Rock on with your bad self. That was a nice story. Good job with the project too.